All products I purchase are top quality and the best no Hassel Warranty. I've ever spent. I had several thousand cases to resize after I discover they do not fit in my AR-15. This little doo-dad tells me instantly with just a glance if I have set my dies to the correct location. Also indicates if case has been sized or not. To use, size your case and insert into comparator. If the head or the mouth sticks out, the case is too long. If the case fits flush to the inside/lower cuts, it WILL fit into ANY rifle for which it is chambered. A great tool. I'm glad I bought mine and I use it with regularity. Easy to use, well made and accurate. I used this gauge to set up my resizing die rather than the "touch and back off" method. I didn't realize how far off I was and careful case prep improved my groups. If you are a beginner loading 223/5.56 Ammo this is a must have tool! This tool helps with setting up your bullet setting die so you do not over crimp & end up with FTF!! The perfect tool for checking your reloads to be sure they won't cause a jam. I fought for years with reloading my AR15 until I purchased this Wilson gauge. I drop every reloaded round into this gauge to be sure it is not oversize. There is just to much inconsistency in brass, so now I can rely on my reloads to feed and fire just like factory stuff. Ordered on Monday, arrived on Wednesday. Easy to use and extremly accurate. 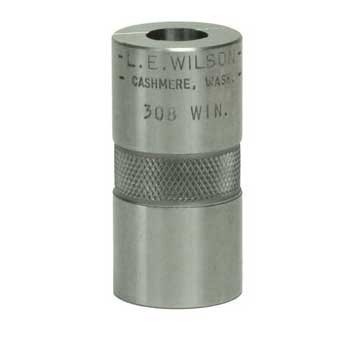 The Wilson Case Gauge, in any caliber, allows the individual to have the confidence and assurance that the prepped cases completed for reloading are within spec and will chamber correctly and safely. A must have for any reloader. I've reloaded for years but never used Wilson products. Setting up for a custom build 22-250, I wanted accurate cartridge headspace measurements and thought I'd try them although there are less expensive versions. This gage is superb tool room quality. You can use it as a go/no-go or using a depth mic measure the deviation from the reference and flip it over and you get case length. Note that they are in the "white" with no surface finish so you must keep them lubricated like precision cutting tools. This gauge is excellent for determining whether case is within tolerance for head space and case length. The gauge I recieved was stamped for 260Rem as ordered. However, the gauge was actually machined to fit 243Win. It was returned for exchange. Otherwise I would give a 5. I don't know how I got along woith out it. These gauges are slick and will improve your shooting.. I use mine (I own several calibers ) to check for case stretch after FL sizing. Easily shows if trimming is needed.